HAZARDOUS DUTY Sonoma County Supervisor James Gore touts a locally sourced cleanup effort. 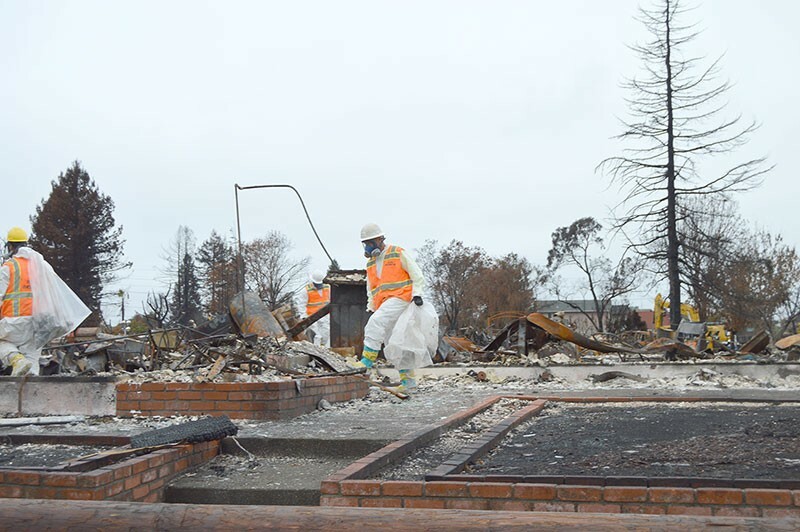 In a victory for a local union force that lost some 30 homes to the North Bay fires, disaster-recovery officials in state and federal agencies hammered out a stop-gap contract on Jan. 12 to keep them working—and to ensure that the North Bay stays on track for debris clearing from the October wildfires. At issue were recent contracts and emergency task orders undertaken by the Army Corps of Engineers (ACOE) with three national companies: AshBritt Environmental, the Environmental Chemical Corporation (ECC) and Ceres Environmental Services—and a locally trained union workforce, Operating Engineers Local 3, based out of Rohnert Park. On Dec. 29, contracts were awarded to ECC to the tune of $475 million, and to Ceres for $160 million. The former contract, with ECC, was devoted entirely to the Sonoma County cleanup, while the latter was dedicated to similar efforts in Mendocino, Lake and Napa counties. The contracts would run through the completion of the debris-removal process, slated for February. But the contract awards were protested by AshBritt, which was passed over in the big-dollar, longer-term contracts. In turn, the company filed a complaint with the Government Accounting Office that's still being sorted out. That move forced the Corps to issue a suspension-of-work order for the two contracts just signed, which meant a potential shutdown of debris-recovery operations. In early January, the state Office of Emergency Services stepped in and signed a $200 million stop-gap contract with ECC, and work continued under a contract that honored the local prevailing wage for skilled workers. Sonoma County Supervisor James Gore says that his understanding of the new ECC contract is that about $170 million is devoted to cleanup efforts in Sonoma County. He's a big supporter, he says, of paying the prevailing wage to local workers. The victory for the Engineers Local, he adds, "absolutely" signaled the power of a regional union workforce to leverage an outcome with ACOE, with the support of other local union shops, including the International Union of Operating Engineers Local 39. "Everyone has coalesced around the main idea," he says, which is that the October fires represented the biggest cleanup effort in the region since the 1906 earthquake. "We are going to rebuild, and we're going to rebuild capacity," he says—which means, in part, "maximize local labor as much as possible." Chris Snyder, district representative for the Engineers Local, is obviously pleased that the local prevailed and that the state intervened to ensure that his workers were properly compensated and that their healthcare benefits were protected along the way. Snyder's view is that the best way to resolve any prevailing wage issue that may arise in the county is to pay it. The Engineers Local fields skilled local contractors who earn between $30 and $41 an hour, he says. Among other tasks, they run heavy equipment and deal with the removal of hazardous materials. "It's not bad money," he says, "but remember, they are part-time," he says. "We are kind of like Uber." Since the fires, the union has trained several hundred heavy-equipment and hazmat-certified workers, he says, and there was grave concern back in December that they'd sit on the sidelines while a lesser-trained and underpaid workforce hired by outside companies arrived on the scene of one of the worst wildfires in state history. "We're doing what we can do to make sure we have a local workforce available," says Snyder. "So far, it's been fairly successful. We are trying to do what we can to support the Corps and their mission," he adds. The intersection between a strong local labor movement and large, national-disaster-recovery companies has been administered by the ACOE, which has standing contracts with those firms and operates as part of the Federal Emergency Management Agency. In this manner, the ACOE is prepared to issue emergency task orders after a disaster, which it did late last year. The Florida-based AshBritt and the Burlingame-based ECC were issued emergency task orders for two months last Oct. 27 under what's called the Corps' "advanced contracting initiative," to jump-start the recovery process. Those task orders paid the prevailing wage.